I used this kit to seal a brand new vehicle we purchased that has leather interior, including door panels and dash. It appeared to clean well. The sealant went on very glossy, but went away after it fully cured. The odor is extreme! I contacted Wolfgang regarding the fatal of in airways statement on the bottle, and they stated no mask was necessary if the directions are followed, but I would recommend some sort of mask. I have only used it once thus far and it was in a dark garage and it worked good. ConsWould not recommend yet. I loaned it to a friend to try on his corvette and will see what he has to say. Jury is still out. I used this kit on a recently purchased Mazda 6. I think the car had been on the lot for a while, so I wanted to clean and seal. 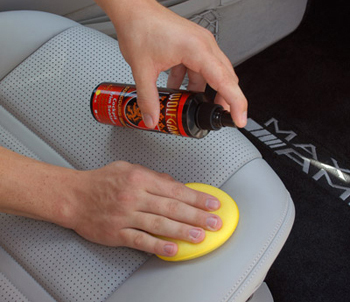 I used the leather cleaner on everything, seats (which are "syn" leather-vinyl), dash, etc. Then sealed everything. The interior just looks fantastic now! I put it to the test when I took our dog the the groomer and the seats got dirty. I vacuumed and cleaned with a microfiber towel and presto-all back to clean. These are great products! ConsThe bottles get a little "greasy" as you use them. I like having a complete kit, basing this kit on others I have seen. This product seems to be used by people who had a greater discerning eye as to a finished product, i.e. a clean vehicle, inside and out. ProsGreat product with lots of positive feedback.